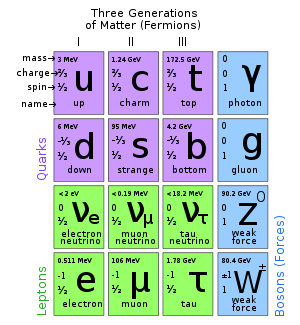 The Standard Model of elementary particles, with the gauge bosons in the last column. In particle physics, bosons are particles that obey Bose-Einstein statistics and are named after Satyendra Nath Bose and Albert Einstein. In contrast to fermions, which obey Fermi-Dirac statistics, several bosons can occupy the same quantum state. Thus, bosons with the same energy can occupy the same place in space. Therefore, bosons are often considered as force carrier particles, whereas fermions are usually associated with matter, although the distinction between the two concepts is not clear cut in quantum physics. Bosons may be either elementary, like the photon, or composite, like mesons. All observed bosons have integer spin, as opposed to fermions, which have half-integer spin. This is in accordance with the spin-statistics theorem which states that in any reasonable relativistic quantum field theory, particles with integer spin are bosons, while particles with half-integer spin are fermions. Composite bosons are important in superfluidity and other applications of Bose-Einstein condensates. By definition, bosons are particles which obey Bose-Einstein statistics: When one swaps two bosons, the wavefunction of the system is unchanged. Fermions, on the other hand, obey Fermi-Dirac statistics and the Pauli exclusion principle: Two fermions cannot occupy the same quantum state as each other, resulting in a "rigidity" or "stiffness" of matter which includes fermions. Thus fermions are sometimes said to be the constituents of matter, while bosons are said to be the particles that transmit interactions (force carriers), or the constituents of radiation. The quantum fields of bosons are bosonic fields, obeying canonical commutation relations. The properties of lasers and masers, superfluid helium-4 and Bose–Einstein condensates are all consequences of statistics of bosons. Another result is that the spectrum of a photon gas in thermal equilibrium is a Planck spectrum, one example of which is black-body radiation; another is the thermal radiation of the opaque early Universe seen today as microwave background radiation. Interaction of virtual bosons with real fermions are called fundamental interactions, and these result in all forces we know. The bosons involved in these interactions are called gauge bosons. All observed elementary particles are either fermions or bosons. The observed elementary bosons are all gauge bosons: Photons, W and Z bosons, and gluons. In addition, the Standard Model postulates the existence of Higgs bosons, which give other particles their mass via the Higgs mechanism. Unlike the gauge bosons, the Higgs boson has not yet been observed experimentally. Finally, many views about quantum gravity postulate a force carrier for gravity, the graviton, which is a boson of spin 2. Fermionic or bosonic behavior of a composite particle (or system) is only seen at large (compared to size of the system) distance. At proximity, where spatial structure begins to be important, a composite particle (or system) behaves according to its constituent makeup. For example, two atoms of helium-4 cannot share the same space if it is comparable by size to the size of the inner structure of the helium atom itself (~10−10 m)—despite bosonic properties of the helium-4 atoms. Thus, liquid helium has finite density comparable to the density of ordinary liquid matter. ↑ SLD, Standard Model of Particle Physics. Retrieved January 25, 2009. ↑ SLD, Introduction to the SLD Collaboration, SLAC Large Detector. Retrieved January 25, 2009. ↑ U.S. Department of Energy, SLAC National Accelerator Laboratory. Retrieved January 25, 2009. Greene, Brian. 2003. The Elegant Universe: Superstrings, Hidden Dimensions, and the Quest for the Ultimate Theory. New York: Norton. ISBN 0393058581. Gribbin, John R., Mary Gribbin, and Jonathan Gribbin. 2000. Q Is for Quantum: An Encyclopedia of Particle Physics. New York: Touchstone. ISBN 0684863154. Sakurai, J. J., and San Fu Tuan. 1994. Modern Quantum Mechanics. Reading, MA: Addison-Wesley. ISBN 0201539292. Schumm, Bruce A. 2004. Deep Down Things: The Breathtaking Beauty of Particle Physics. Baltimore, MD: Johns Hopkins University Press. ISBN 080187971X. Seiden, A. 2005. Particle Physics: A Comprehensive Introduction. San Francisco: Addison Wesley. ISBN 9780805387360. Srednicki, Mark Allen. 2007. Quantum Field Theory. Cambridge: Cambridge University Press. ISBN 978-0521864497. This page was last modified on 25 January 2009, at 17:07.